Lessons of the past. Hope for the future. It is no wonder, then, that in 1869 it was determined that the first Minnesota camp meeting would be held at Elder Ingraham’s farm between Wasioja and Mantorville. God had provided, through the railroads, a means for Adventists across Minnesota to more easily congregate for fellowship. Of course, the existence of the railroads still didn’t create an experience of ease for those attending camp meeting. 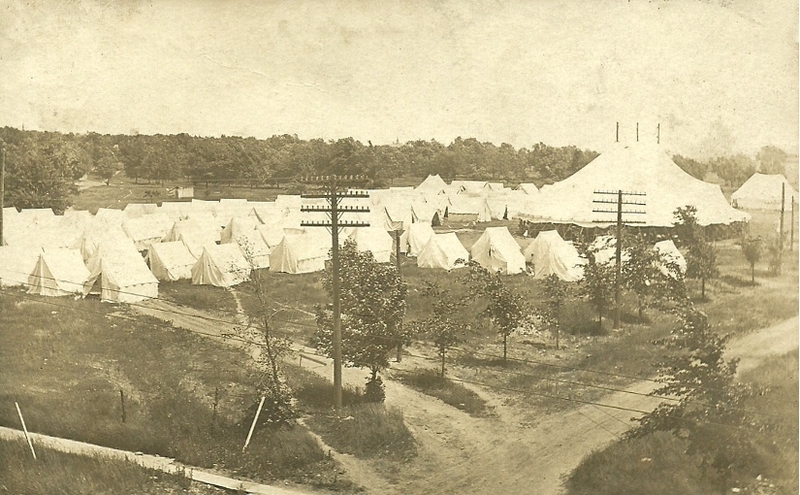 Campers still had to contend with uncertain weather (tornadoes and thunder storms in particular), challenges like the grasshopper plagues (most notable in 1875 – read Laura Ingalls Wilder’s “On The Banks of Plum Creek” for a vivid tale of these plagues), and the trials of setting up camp with heavy canvas tents, stuffing bedding ticks with straw, and dealing with the sanitary issues attendant to a large gathering with none of our modern-day plumbing conveniences. And it only took one camp meeting, the first one in 1869, to discover that October was not ideal camping weather – after that, Minnesota camp meetings were always held in the summer months! Also, there were some who were not able to travel by rail either due to the expense or because no rail was located close enough to their home. These often came by covered wagon and then camped in the wagon at the camp meeting – similar to our modern-day Winnebagos! In 1878, it was reported that Bro. Harlow, seventy-six years old, drove his team three hundred miles, from some place in Dakota! Talk about dedication! But, with experience, camp meeting committees learned how to deal with the obstacles and they created a list of needs for camp meeting locations. First of course, was the need to be close to a railroad – this need existed well into the 1900’s. The railroads often gave reduced fares, such reduction usually being given for the fares back home – return trips sometimes even being free. It was also found important to be close to a city for transportation and to enable walking on foot to and from the city if campers should need supplies. At the beginning, SDA camp meetings were of an evangelistic nature and it was felt that it was important to move the camp meeting from one place to another each year so as to expose various areas of the state to the Adventist message. Over the decades, however, the annual meetings gradually became more focused on nurturing SDA members and so it was eventually determined that it was not needful to move the meetings about – thus, saving considerable expense by not needing to move camp meeting supplies from one place to another. Thus, you may note that towards the end of the 1800’s, camp meetings started to gravitate more towards the Minneapolis-St. Paul area – for one thing, in addition to the rail system, the Twin Cities had a fantastic street car line. (Read about the street car lines at the Minnesota Streetcar Museum.) http://www.trolleyride.org. Still, occasionally, camp meetings were held in other areas in an attempt to alleviate the burden of traveling from one part of the state or another, but after a year or two, it would end up back in the Minneapolis-St. Paul area again. For 53 years, camp meetings moved about the state before the annual gathering was finally permanently settled on the Anoka campground. Well-planned camp meetings were a time of refreshing for all who attended. Speakers brought words of inspiration to the campers, encouraging all to gain a stronger walk with God. James and Ellen White were present and spoke at the first Minnesota camp meeting in 1869 as they did for many subsequent meetings thereafter. Often they were joined by pillars of the church such as Uriah Smith and J. N. Andrews. Meetings were often held in a variety of languages – in 1884, it was noted that meetings were held in four different languages, English, Danish, Swedish, and German. Scandinavian meetings continued to held in separate tents into the 1950’s. In the earliest days, meetings were evangelistic in nature, but with time, they changed to be more of a nature to educate, train, and encourage members. Surprisingly, the first camp meeting in 1869, specifically requested that children not attend! This quickly changed, however, and soon there was an abundance of excellent services for the children and youth. This spirit of dedication in the Minnesotans, was usually manifested in their financial generosity to God’s work – this even despite serious financial setbacks such as the grasshopper plagues. Even in the first decades of camp meetings, thousands of dollars would be given in meetings – such sums being extraordinarily large for that era. Often, offerings would totally cover expenses and leave excesses that could be used for work in other states. When you combine the financial support provided by the Minnesotans with the support they provided in sending out missionaries, ministers, healthcare workers, etc. to areas outside of their state, it is evident that Minnesota played a very integral part in furthering the Adventist message – not only in our nation, but also around the world! Certainly camp meetings were an integral part of preparing Minnesotan Adventists for their mission. Minnesotans are still claiming each year that camp meeting was “the best camp meeting we’ve ever had in Minnesota”!